Sign up. Yes, I am sorry, but you are going to have to sign up with them in order to download or order magazines. They have many to choose from. 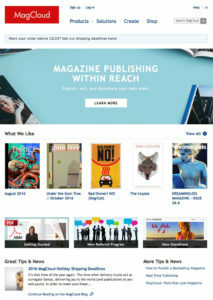 Once you have the magazine, download a free digital (.pdf) copy to read at home, or order a printed version, which also includes paying for shipping costs. Receive magazine, read and enjoy. Ask yourself – Do I know anyone who would like to have this kind of publicity? Do I know anyone who would like to advertise their product or service? Is there an upcoming German, Swiss or Austrian event? Briefly note the date of the next publication. You can also sign up to “follow” PorterPR on MagCloud, which will ensure you get personally contacted, once the next magazine is published there. Visit www.westcoastgermannews.com to leave your comments/feedback. Das Schwarze Brett Will Arrive in October! 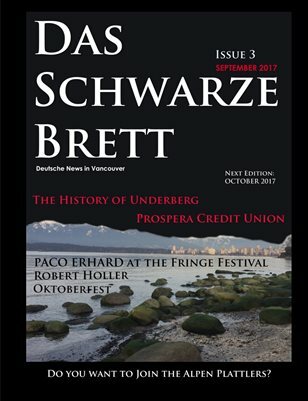 Das Schwarze Brett Magazine will be Published in October! “Das Schwarze Brett” will be rising from the ashes, back from 2002, when I moved back to Vancouver from Sydney, Australia. We lived in downtown Vancouver in a small apartment and I had just taken my first desktop publishing & website course in a private college in the Bentall Building. I started building websites, writing newsletters and joining social media and have been fascinated every since. I started a couple of websites, produced a few newsletters, worked with communications experts and generally practiced journalism, blogging, photography, advertising & more. I helped publish the Swiss Herald for the Swiss Society, I started “German Voices Vancouver”, which turned into Westcoast German News and also got involved with all of the various German organizations in Vancouver in one way or another. Now, my children are finally at the stage where I can focus on my business and make a living out of it. I have been applying for jobs, but am having trouble finding something that will me to practice the skills I wish to excel in. My passions are Photoshop, InDesign, YouTube and blogging in general. I am going to start with a magazine – maybe even with more than one – and go from there. I want to end up working for a German Television Show. 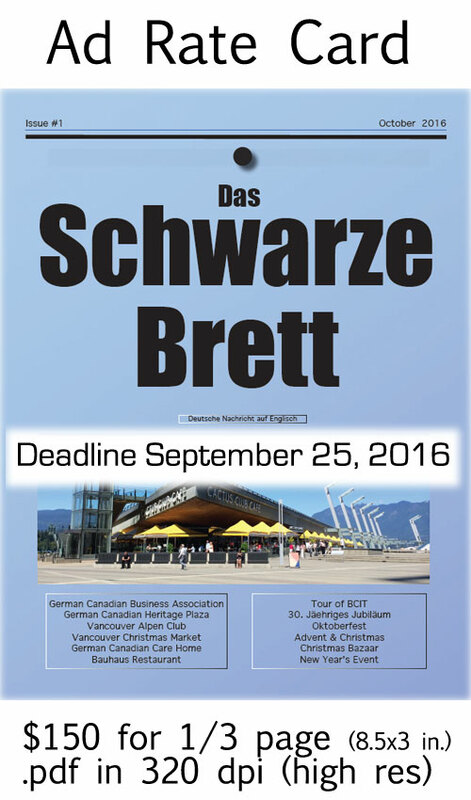 Das Schwarze Brett will be published every two months and sold through this website and the MagCloud platform. If you wish to participate, you can send me your story ideas, events or ads and hopefully it will grow into something big and important. I also plan to spend more time sharing news and blogging on my website. If you have recipes, jokes, short news items (about new things – not ads) and interesting tidbits that would interest the German readers, I would love to receive them. The deadline to be involved in my first issue is September 25th, 2016. This is when I would need to have the ads and payment by. If you need an ad designed, this will cost you $50 if I do it and $100 if you want an actual graphic designer to help you out. A designer makes between $30 and $40 an hour, and it can take time to design the ad, format the images and write the copy. You can also sign up to my Westcoast German News Newsletter on this website. You’ll love the Way You Can Replace All of Your Supplements! Vancouver, October 1st, 2015 – The good news is that aloe vera can replace the almost 18,000 different health supplement that have flooded grocery & drug stores in North America recently. The bad news is that drinking pure aloe vera gel takes some getting used to. But when you learn about the 15 major health issues that can this miracle plant can solve, you might decide to run out and try it. Certified trainer & lifestyle Coach Sandra Rechsteiner has written a book “Your Natural Health Beauty and Wellness Guide” that will show you how to successfully incorporate this miracle plant in your life at her October 19th Book Launch at TenTen Tapas at 5:30 pm. For just $25, guests by invitation only will participate in a selfie-contest, sign a video guestbook, and receive a free copy of the book, complimentary drinks & appetizers, as well as a gift bag full of surprises. Members of the media will receive a free pass just for attending. Rechsteiner will also read from her book and be available to show you how to stay vital, fit, healthy, beautiful & happy. Accomplish Now is a global leader in holistic health. The company offers a wide range of products and services designed to help you shape up, lose weight, feel great and be the person that you always wanted to be. Swiss-born Sandra Rechsteiner is not only a coach and personal trainer, but also mentors people to find their purpose and passion to succeed in business and in life. Because of high demand of her book, Rechsteiner will also be launching a German translation in Europe in November. Her next book will focus on her own truly inspirational story: the mindset that allowed her to survive cancer and reach for her big goals now. You can learn more at www.accomplishnow.com. Rechsteiner’s book is available on Amazon & Kindle. Interview with certified trainer & lifestyle coach Sandra Rechsteiner! Sandra has recently written her first book: Your Natural Healthy Beauty and Wellness Guide, where she shares the benefits of “nature’s purest gift” Aloe Vera. After helping Sandra edit and prepare her book for publication, I felt that my readers might be very interested in learning what motivated Swiss-born Sandra to want to write this particular book and why you should buy your copy today! 1. How did you get an idea for the topic? My idea was to create an everyday guide to educate people about the many benefits of the power of nature’s purest gift Aloe Vera. This amazing plant has been around and known for centuries and yet in today’s world is not being used on a daily basis to prevent and help heal sickness. I personally have experienced how important mental and physical health is and personally have experienced how aloe vera can you stay vital, fit, healthy, beautiful and happy. Little plant with big benefits! 2. Who inspired you along the way to keep writing? My husband and all the people around the Globe already introduced to the amazing benefits of Aloe Vera and who I successfully helped in becoming Forever FIT, healthy and beautiful with Aloe Vera. I experienced people getting rid of allergies, ekzymans, restless leg syndromes, joint pain, headaches, colds, excess weight, digestive problems, sleep problems, burns, lack of energy and much more, and in my case Aloe Vera has helped me becoming pain free after holistically smashing my untreatable cancer over a period of 8 years. 3. Did you enjoy writing when you were in school? 4. What is your background in health and fitness? 5. What do you hope that your readers will do after reading the book? After reading this book, you will simply feel like you have to run out and get some Aloe, trust me. I help you to make the right choices to add Aloe to your daily routine and I hope you will decide to value Health as your # 1 priority and take action now before it is too late. I help you change your Lifestyle and you will become unstoppable. Me and my husband are traveling the World, living at different places. I will be speaking on stage in front of thousands of people and empower and educate them all, on all contingents to choose NOW to live their live at its best and to Dream BIG. 7. How can people use this book? This book is available in e-book version and paper version. A MUST-READ for all the people you care about. The more people read about the power of Aloe and how it can positively increase their well being, restore their beauty for a longer lasting life, the more we all can help others. I can’t do this alone and therefore I invite all the readers to invite others to get the book. I invite you to carry where ever you go, the every day use tips are easier to look up that way and you are always ready to make a difference to the World, because when you meet someone, who can benefit from this book and who can not, you can sell it to that person too. Westcoast German News is back with an exciting September Edition starring Oktoberfest. We tried to include a little something from all of our states and provinces located on the west coast of Canada and the US. Alberta, British Columbia, Washington, Oregon & California. This edition is the first one to have our new logo, that I have designed recently. Squares in the colour of the German Flag, with the initials W. G. N. inside of them. It is a simple design that hopefully gets the message across without being overwhelming. There are always people who are supportive each month, but in this month, I particularly enjoyed hearing from people like Mike Anderson, who is from the OKTOBERFEST IN EL CAJON. (San Diego) You can read the press release and see photo in this edition. We also introduce the new General Consulate Josef Beck, and we give you the list of German Schools, at least those found in British Columbia. Next edition, I will include others. Speaking of my next edition, I plan to focus on things like St. Martin (the annual lantern festival), Thanksgiving and Remembrance Day. If you have any events, ads or stories I should know about that you want to share with my ever-growing audience, I would love to hear about it. Otherwise, please visit www.magcloud.com and follow me there! Share this magazine on your social media. Send it to your family and friends, and best of all, order copies from MagCloud for your Oma or Tante. This magazine will be available as a free download on our Digital Products page. You can read it as a .pdf, print it out yourself at home, or order an actual magazine version on MagCloud for $5 + shipping. 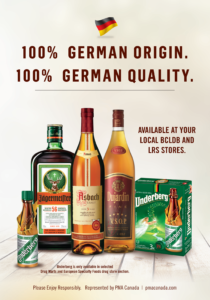 Looking forward to connecting you to the German Community on this side of North America! Then, I am making this issue an “Oktoberfest Special” with a deadline of September 10th. Any images send to me, must be 300 dpi (at least) and in the .pdf format. I will also accept articles, press releases, online interviews and other accouncements. Finally, if you would like to place an ad (keeping in mind it needs to be family-friendly and G-rated), the rate for all ads up to 1/2 page is $55 this time around. Soon, as subscribers increase, I will be asking for more money, but for now I am going with “one fee fits all”. I also offer ads on my website for $5 a month or $60 a year. Sponsors donating $100+ will get a shout out, a blog post, a free ad and the ability to publish an event/picture.